This level has medium difficulty. 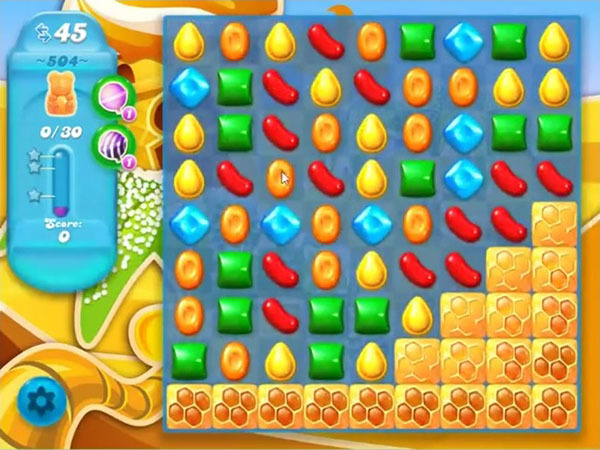 For this level try to play near to honey blockers and bottom of the board to shuffle the candies. It will help to get more special candy. Combine special candies with each other to break more blockers and honey to save the bears. Min is only 40 moves also, not enough! I tried this level over 50 times with and without boosters. It’s a nightmare – closest I’ve got is 3 bears left. Sorry, but this is not “medium” difficulty. This is insanely difficult. I usually make it past the first board with fewer than 20 moves remaining. The most was 24 moves and that was not enough. The only way of beating it is for the game to start forming multiple, random color bombs and soda bombs. Otherwise it is like spinning the bonus wheel on the Candy Crush and getting the Jackpot. Not gonna happen. I am at the point of walking away because I not going to buy extra lives, which is seemingly what is needed.